Aristotle (384–322 BC) first recorded that burning coals produced toxic fumes. An ancient method of execution was to shut the criminal in a bathing room with smouldering coals. What was not known was the mechanism of death. Greek physician Galen (129–199 AD) speculated that there was a change in the composition of the air that caused harm when inhaled. In 1776, the French chemist de Lassone produced CO by heating zinc oxide with coke, but mistakenly concluded that the gaseous product was hydrogen, as it burned with a blue flame. The gas was identified as a compound containing carbon and oxygen by the Scottish chemist William Cumberland Cruikshank in the year 1800. 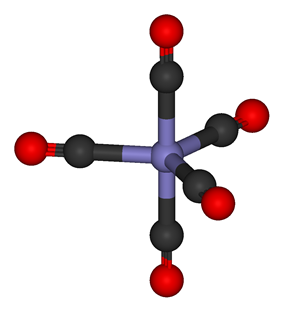 Its toxic properties on dogs were thoroughly investigated by Claude Bernard around 1846. During World War II, a gas mixture including carbon monoxide was used to keep motor vehicles running in parts of the world where gasoline and diesel fuel were scarce. External (with a few exceptions) charcoal or wood gas generators were fitted, and the mixture of atmospheric nitrogen, carbon monoxide, and small amounts of other gases produced by gasification was piped to a gas mixer. The gas mixture produced by this process is known as wood gas. Carbon monoxide was also used on a large scale during the Holocaust at some Nazi extermination camps, the most notable by gas vans in Chelmno, and in the Action T4 "euthanasia" program. 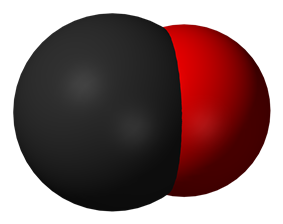 Carbon monoxide has a molar mass of 28.0, which makes it slightly lighter than air, whose average molar mass is 28.8. According to the ideal gas law, CO is therefore less dense than air. The bond length between the carbon atom and the oxygen atom is 112.8 pm. This bond length is consistent with a triple bond, as in molecular nitrogen (N2), which has a similar bond length and nearly the same molecular mass. 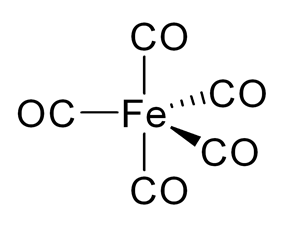 Carbon–oxygen double bonds are significantly longer, 120.8 pm in formaldehyde, for example. The boiling point (82 K) and melting point (68 K) are very similar to those of N2 (77 K and 63 K, respectively). 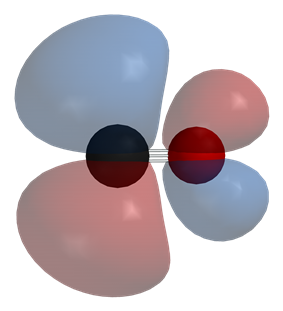 The bond dissociation energy of 1072 kJ/mol is stronger than that of N2 (942 kJ/mol) and represents the strongest chemical bond known. Carbon and oxygen together have a total of 10 dipolar bond. This causes a C ← O polarization of the molecule, with a small negative charge on carbon and a small positive charge on oxygen. The other two bonding orbitals are each occupied by one electron from carbon and one from oxygen, forming (polar) covalent bonds with a reverse C → O polarization, since oxygen is more electronegative than carbon. 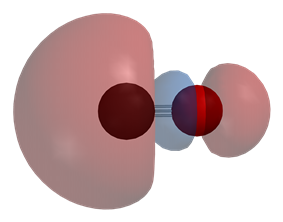 In the free carbon monoxide, a net negative charge δ- remains at the carbon end and the molecule has a small dipole moment of 0.122 D.
Carbon monoxide poisoning is the most common type of fatal air poisoning in many countries. Carbon monoxide is colorless, odorless, and tasteless, but highly toxic. It combines with hemoglobin to produce carboxyhemoglobin, which usurps the space in hemoglobin that normally carries oxygen, but is ineffective for delivering oxygen to bodily tissues. Concentrations as low as 667 ppm may cause up to 50% of the body's hemoglobin to convert to carboxyhemoglobin. A level of 50% carboxyhemoglobin may result in seizure, coma, and fatality. In the United States, the OSHA limits long-term workplace exposure levels above 50 ppm. 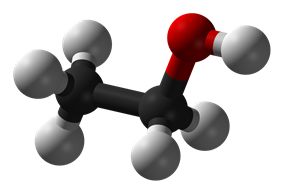 Within short time scales, carbon monoxide absorption is cumulative, since the half-life is about 5 hours in fresh air. Carbon monoxide is produced naturally by the human body as a signaling molecule. Thus, carbon monoxide may have a physiological role in the body, such as a neurotransmitter or a blood vessel relaxant. Because of carbon monoxide's role in the body, abnormalities in its metabolism have been linked to a variety of diseases, including neurodegenerations, hypertension, heart failure, and inflammation. CO functions as an endogenous signaling molecule. CO modulates functions of the cardiovascular system. CO inhibits blood platelet aggregation and adhesion. CO may play a role as potential therapeutic agent. Carbon monoxide has been proposed for use as a fuel on Mars. Carbon monoxide/oxygen engines have been suggested for early surface transportation use as both carbon monoxide and oxygen can be straightforwardly produced from the atmosphere of Mars by zirconia electrolysis, without using any Martian water resources to obtain hydrogen, which would be needed to make methane or any hydrogen-based fuel. In the presence of strong acids and water, carbon monoxide reacts with butyl lithium) react with carbon monoxide, but these reactions have little scientific use. Normal circulating levels in the blood are 0% to 3%, and are higher in smokers. Carbon monoxide levels cannot be assessed through a physical exam. Laboratory testing requires a blood sample (arterial or venous) and laboratory analysis on a CO-Oximeter. Additionally, a noninvasive carboxyhemoglobin (SpCO) test method from Pulse CO-Oximetry exists and has been validated compared to invasive methods. Carbon monoxide is absorbed through breathing and enters the blood stream through gas exchange in the lungs. It is also produced in hemoglobin metabolism and enters the blood from the tissues, and thus is present in all normal tissues, even if not inhaled. 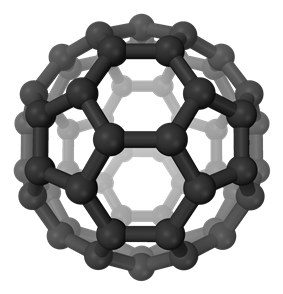 Carbon monoxide is a short-lived greenhouse gas and also has an indirect radiative forcing effect by elevating concentrations of methane and tropospheric ozone through chemical reactions with other atmospheric constituents (e.g., the hydroxyl radical, OH.) that would otherwise destroy them. Through natural processes in the atmosphere, it is eventually oxidized to carbon dioxide. Carbon monoxide is both short-lived in the atmosphere (on average about two months) and spatially variable in concentration. Carbon monoxide is present in small amounts in the atmosphere, chiefly as a product of volcanic activity but also from natural and man-made fires (such as forest and bushfires, burning of crop residues, and sugarcane fire-cleaning). The burning of fossil fuels also contributes to carbon monoxide production. Carbon monoxide occurs dissolved in molten volcanic rock at high pressures in the Earth's mantle. Because natural sources of carbon monoxide are so variable from year to year, it is extremely difficult to accurately measure natural emissions of the gas.